LONDON--(BUSINESS WIRE)--The latest market research report by Technavio on the global loop calibrators market provides an analysis of the most important trends expected to impact the market outlook from 2018-2022. According to Technavio analysts, the global loop calibrators market is expected to grow to over USD 130 million by 2022. The growing demand for intrinsically safe calibration is a major factor driving the market’s growth. Intrinsic safety is a standard deployed in the industries that deal with significant explosives atmosphere. These industries need to verify their operations as “intrinsically safe”. This ensures that devices do not release sufficient energy that can cause ignition when in contact with flammable materials. Equipment must be free from electrical sparks, arcs, flames, electromagnetic radiation, mechanical friction, and impact and ionizing radiation. In industries such as petrochemical, mining, and pharmaceutical, the importance of safety with respect to the aforementioned parameters is stressed upon. Thus, intrinsically safe calibration can minimize the inherent risk involved in hazard-prone working environments. The significant need for maintaining accuracy in operational processes of industries has increased the demand for loop calibrators. The number of third-party service providers is increasing to maintain the operating health of the rising number of industrial equipment. These services providers maintain contracts with end-users to track instruments at their premise and notify end-users before they fail to function on-site. At times, end-users use calibrators to manage minute deviations. “Third-party service providers find it easy to use them on-site to perform calibration on electrical measurement devices as loop calibrators are portable. Calibrators are crucial for appointing new installations and maintaining operating conditions of industrial instruments. The rising demand for IIoT also influenced end-users to adopt loop calibrators as they can be easily connected with cloud computing. It is also noted that industries are renovating their infrastructure and installing industrial communication networks such as Ethernet, Fieldbus, HART, and wireless connectivity with which calibration tools will ease the efforts of calibration services and drive the growth of the global loop calibrators market,” says a senior analyst at Technavio for research on automation. This market research report segments the global loop calibrators market into the following end-users (third-party service providers and in-house maintenance teams) and key regions (the Americas, APAC, and EMEA). The need for documenting the output of calibration services has increased. The need for accurate reporting of information about the operational condition of industrial equipment is also growing. The market in APAC will contribute the highest market share during the forecast period, followed by EMEA and the Americas. 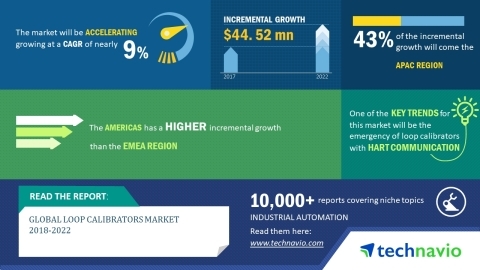 Technavio market research analysts forecast the global loop calibrators market to record a revenue of over USD 130 million by 2022.